Will: You are currently a Master of Engineering Management candidate, what got you to this point? Bachar: During my time at undergrad, I was excelling in my mechanical engineering courses and I truly enjoyed the material. However, through humanities and social science electives, I discovered that I had a strong fondness for business and economics. That fondness was also apparent to my supervisors during my engineering internships. In fact, it was so apparent that most of them advised me to pursue a master’s degree in management. They believed that my emotional intelligence and business savvy would complement my technical background nicely. Will: You plan to enter the field of management consultancy, what got you interested? Bachar: There are many reasons why I would like to be a management consultant. First of all, I take pleasure in interacting with clients and relish the “human element” of the consulting profession. Furthermore, I enjoy solving new problems and tackling diverse challenges while on the job. I would like to keep on learning and stimulate my brain by taking on intriguing projects. In addition, I believe consulting would allow me to have a much better understanding of business management, and therefore, enable me to see the bigger picture. Unfortunately, most engineers fail to accomplish the former. Finally, given that I am single and in my early twenties, traveling and visiting different cities is very appealing to me at this moment! Will: What advice would you give to students looking to get into the STEAM field? Bachar: This is a great time to be in the STEAM field. The job market is looking good and opportunities are abundant. Nevertheless, there is a lot of competition out there for those opportunities. So, work hard, study well and make sure you have good grades. A stellar academic record goes a long way in setting you apart! Will: What was your journey like to get where you are today? Bachar: It’s been a crazy ride thus far. I had to work hard for everything that I own. A dream of mine, when I was young, was to attend an Ivy League institution. And after countless all-nighters, today, here I am. My parents always used to tell me: “you reap what you sow.” Looking back now, indeed, all that effort paid off. Will: You’re always running, what motivates you to run? Bachar: I have been passionate about running for as long as I can remember. Ever since I was a child, every Sunday, my siblings and I would accompany my father on his morning power walk. Once out of the car, my sister and I would bolt out in front of my younger brother and father. The race was on. Sometimes she would win, sometimes I would win. Even if we both grew tired, we would never settle for a tie. One of us had to give in and concede. We wanted the bragging rights that came along with the win. This sense of competition accompanied me as I grew, pushing me lately to participate in several races against runners that were equally as good, if not better. Running has always been an escape for me. The whole world shuts down when I’m on a run listening to my music. It’s my own form of meditation. Most of my successful endeavors have been conceived while running. Today, I am proud to say that I have completed over three hundred forty runs in the past year, amounting to over one thousand eight hundred thirty miles. Will: If you could travel anywhere, where would you go and why? Bachar: London, for sure. I’m actually planning on going there with some of my friends this summer. I am a diehard fan of the North-London-based soccer team Arsenal and have been supporting them since 2008. Because of that, London occupies a special place in my heart. I’ve always dreamt of watching the Gunners play at the Emirates Stadium. Hopefully, it won’t be long until dream turns into reality! Will: What is a skill you’d like to learn and why? Bachar: As a mechanical engineer, I haven’t had in-depth exposure to programming. Learning how to code well has been a goal of mine as of late. I am currently looking into taking courses in Python and C++ during the coming terms at Dartmouth. Will: Any final words of wisdom you would like to give to the community? Bachar: One’s time is valuable and scarce, so make sure you spend it wisely and with the right people especially. As human beings, we are all driven by success. However, it is the small things in life that matter. Having a deep conversation with your friend over coffee or helping a family member in need can make one’s week. In general, as a professional, work-life balance is crucial. In addition, leading a healthy lifestyle, exercising and getting plenty of sleep will boost one’s productivity and mood. Unfortunately, in our work culture nowadays, these factors are often neglected or downplayed. 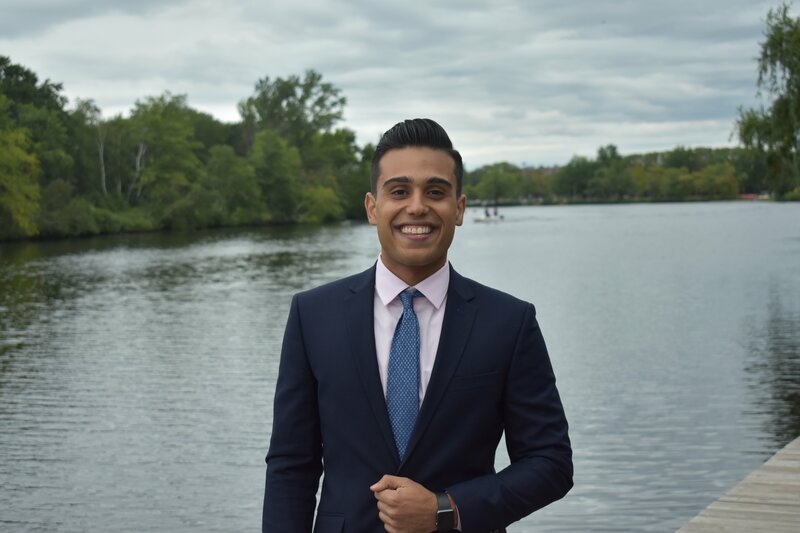 Connect with Bachar on Linkedin!